After putting it off since Wednesday, I had to cave in and go shopping. It was the horrible kind of shopping: in and out of 100 different places. Not my idea of fun at all. And I find it so depressing walking around a town centre with shops I’d intended to go in standing empty, and pawnshops, money advance and sell-your-gold shops springing up like weeds. Still, with Mini Minx for company, it was bearable. And it gave me the excuse (like I need one…) to go to my favourite pizza house in town and glug coffee. And try some posh perfumes in Boots – it really tickles me to spray on something expensive and ask Mini’s verdict: “Yummy or yucky?” I generally hate the stuff, but she gives it so much thought! So far she thinks Miss Dior Cherie is ‘yum-yum’, J’Adore is ‘sicky-yuck’ and Allure is ‘picy-orange’ (spicy). At the pizza restaurant, Mini decided that she’d prefer to sit in a grown-up chair for once. She chose her own milk-shake (chocolate) and drank it so neatly. At 2.5 years, Midi was still needing a biiiiiiig bib, whereas Mini is such a delicate little eater, with her nimble, dainty little fingers. Again, she must get that from her Daddy – I’m more the wolf-it-down-before-it-escapes-or-fights-back kind of eater, like Midi. 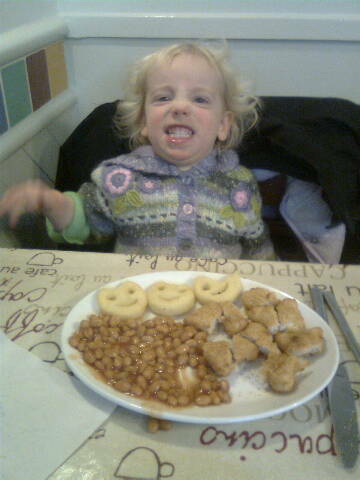 There’s only one part of Mini’s eating that she gets from me: her sense of humour… Now, rather than something spicy or adult, she’d asked for chicken teddies in breadcrumbs, baked beans and smily potato faces. Treat food, that she never gets at home (well except the beans). Anyway, she lined up her potato faces and took a careful bite out of each one, then lined them up, just so. “I eat up all a heads – hehehehehe!” she cackled with a maniacal laugh. Minx! Full of food and caffeine, we headed to Tesco where Mini only agreed to go in the shopping trolley if I padded the seat for her – her little thighs weren’t happy against the thin plastic seat. Just the job for the marshmallowy Carmin Fish sling! She rested her tired little head on a roll of soft shopping bags and only got excited when we went down the home baking aisle – that’s my girl! This entry was posted in food, Out and About, the things kids say and tagged children, humour, restaurant, shopping with toddlers by GrumpyOldTrout. Bookmark the permalink.